This year, change swept through the corridors of power in the United States, Asia and Europe, with US President Donald Trump taking office, China's President Xi Jinping unveiling a new team at the top, and new leaders taking over in countries such as France and South Korea. Free trade came under growing pressure from the forces of protectionism and populism, jeopardising agreements such as the Trans-Pacific Partnership. Political and economic changes aside, new technologies continued to both enrich the lives and endanger the livelihood of millions worldwide. The Straits Times Global Outlook Forum returns on Dec 5, to help readers make sense of these changes and what they can do to prepare for the challenges in the new year. 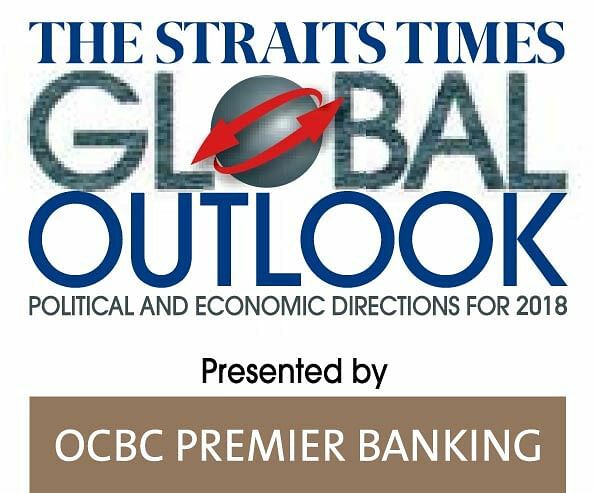 Titled 2018: Facing The Challenges Of A New World Order, the annual conference is organised by The Straits Times in partnership with presenting sponsor OCBC Premier Banking. The keynote speaker for this year's forum at the Ritz-Carlton hotel will be Minister for Finance Heng Swee Keat. One panel discussion at the forum will be dedicated to the issue of cyber security. Experts from the government and private sector will look into hacking and what can be done to fend off such attacks at the discussion to be moderated by ST senior technology correspondent Irene Tham. One speaker is Mr David Koh, chief executive of the Cyber Security Agency (Prime Minister's Office) and deputy secretary (special projects) and defence cyber chief at the Ministry of Defence. He will be joined by Mr Richard Skinner, partner (strategy) of consultancy PwC Singapore, and Mr John Lee, president of the Singapore chapter of Isaca, which advocates for professionals in information security, assurance, risk management and governance. Eleven-year-old Reuben Paul, a Texas-based cyber security ambassador and "child hacker", will also be delivering a special address. Another topic at the forum is global politics. One question to be discussed is what the world can expect as President Xi wants China to move centre stage in global affairs, while leaders in the West are increasingly distracted by populism, nationalism and voter discontent. The audience will hear from prominent historian Wang Gungwu, Associate Professor Elvin Lim, head of the department of political science at the National University of Singapore (NUS), and Mr Richard Jerram, chief economist of the Bank of Singapore. Professor Wang, chairman of the ISEAS - Yusof Ishak Institute, the East Asian Institute and Lee Kuan Yew School of Public Policy (NUS), will give his views on China after the recent 19th national party congress; Prof Lim, who specialises in US politics, will offer his take on America in the Trump era. Joining them from ST are associate editor Rahul Pathak, who will talk about his recent reporting trip to North Korea, and Ms Audrey Quek, Opinion editor (global affairs), who will moderate the discussion. • Registration fee is $230, but there is an early bird special of $185 if you register by Nov 20. There are further discounts for group purchases and OCBC card holders.